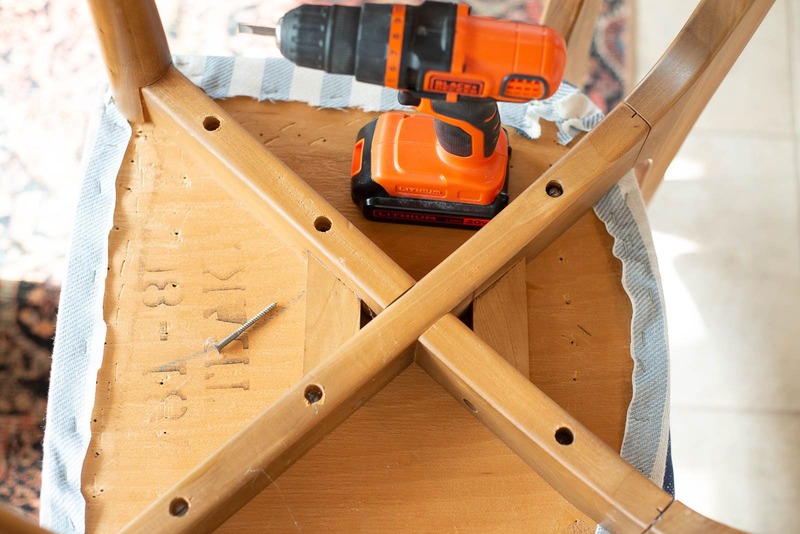 This chair makeover features how to fix old chairs. 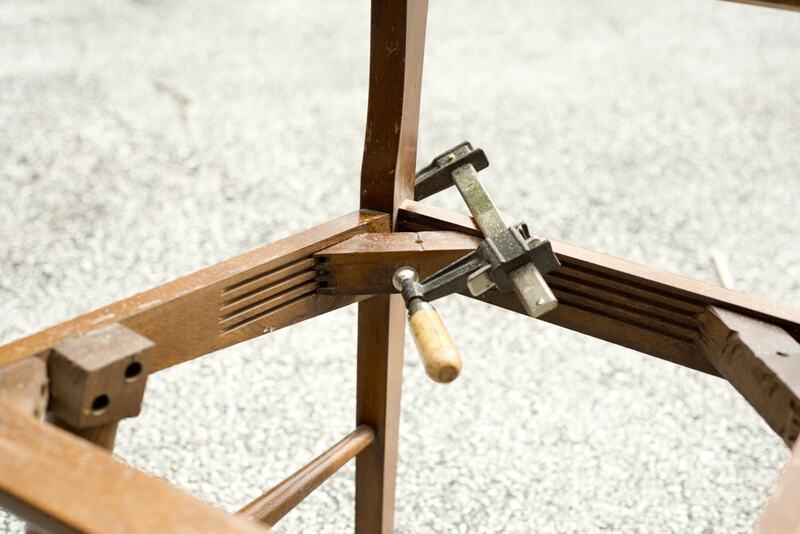 Fix loose chair backs with a simple pipe clamp and transform a chair with new upholstery. 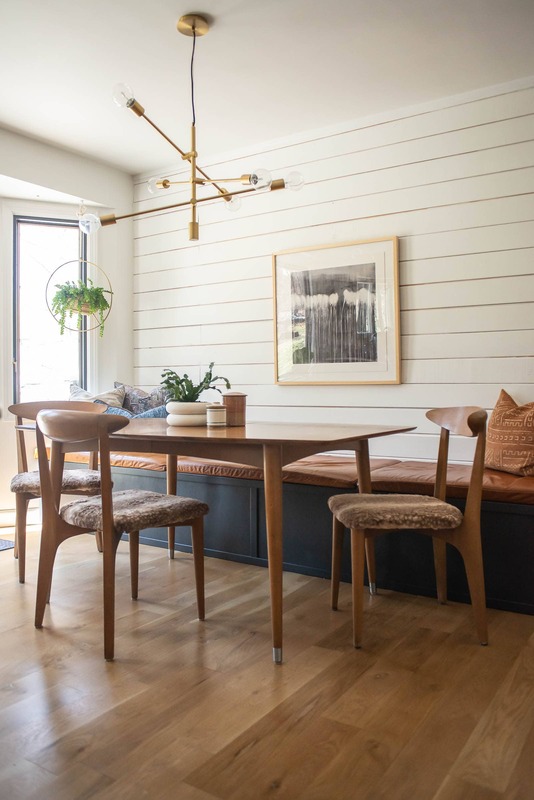 These simple chair updates will give new life to your old chairs and won’t break the bank or take a lot of your time. 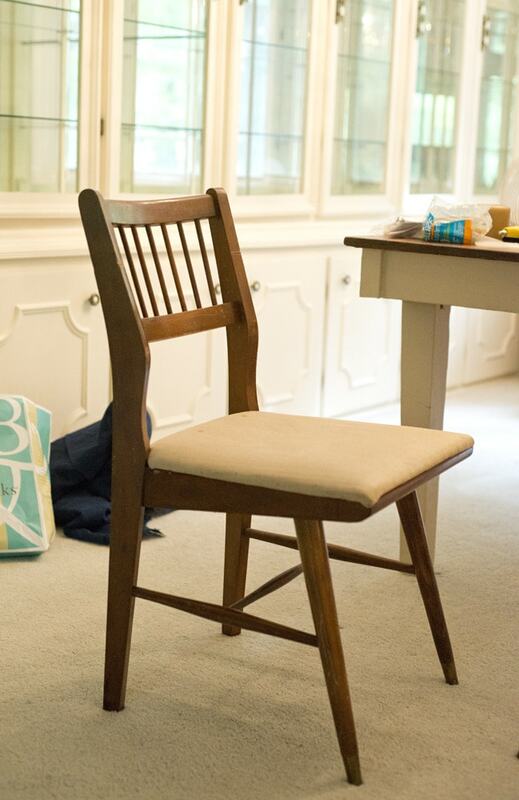 Learn how to update a chair with this tutorial! 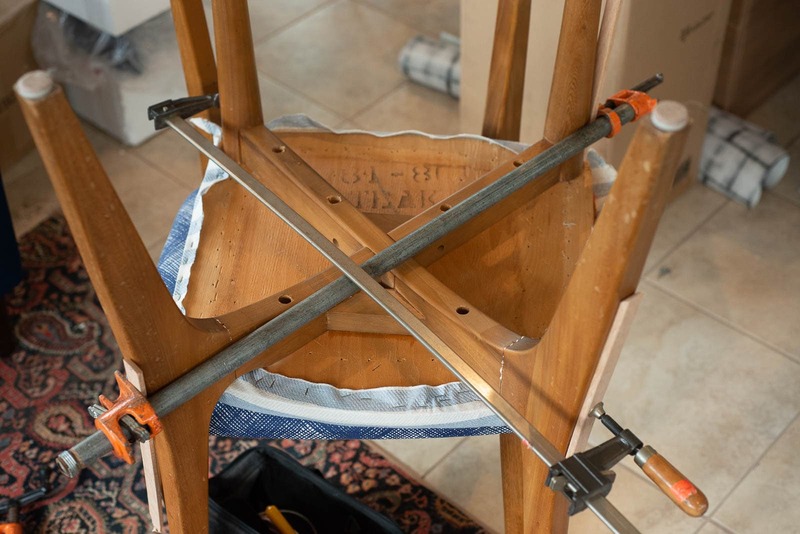 I’ve fixed a few different types of old chairs, so I’ll share the process on both so you can see how the chair repair differs just a bit depending on how the chair was originally built. Here’s the first chair. I needed to fix the loose chair back on a few of the chairs in this set. To do this, I took off the corner bracket, added wood glue to the area, screwed the corner bracket back in and then clamped it together until the wood dried. A few of these chairs also had some scratches and stain differences. I lightly sanded some of the spots with issues and then applied a spray stain in those places where it was needed. The stain color was close enough to the original that I could just lightly spray it on and it matched. After the stain dried, I brushed on poly. While the poly was drying, I grabbed the old chair cushions and reupholstered them. 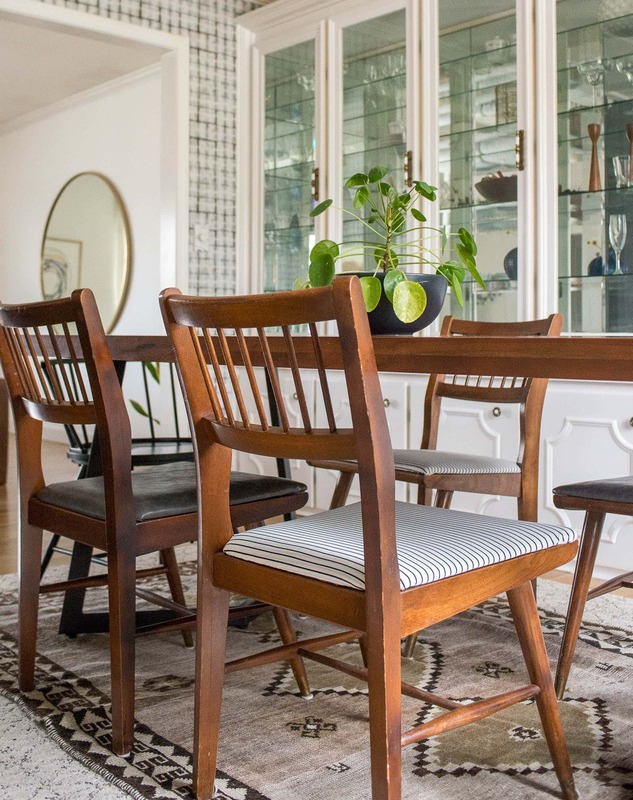 Reupholstering dining chairs is pretty easy. I have a step-by-step tutorial for how to reupholster a chair if you want to try it for yourself! I’ve done it quite a few times and have always been pretty happy with the results. Remove seat cushion (if possible) to determine what part of the chair connection is broken or loose. 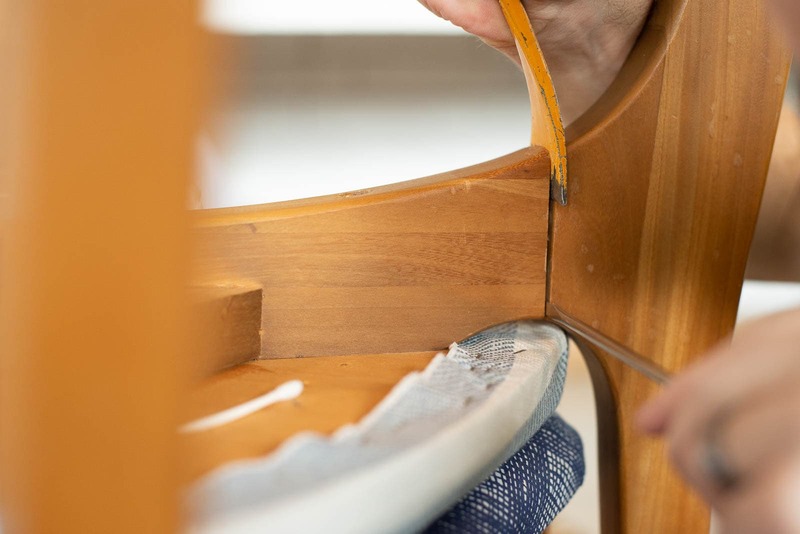 Loosen chair connection even more to apply wood glue to the seam. 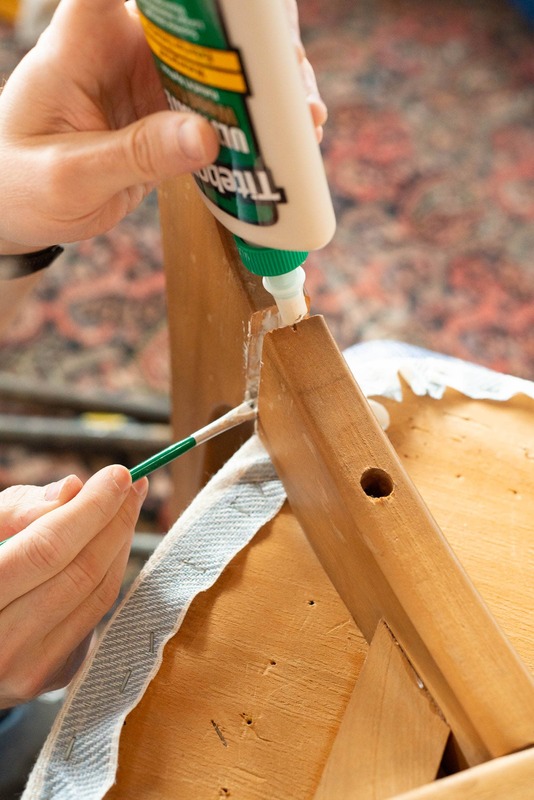 Clamp chair connection with wood glue until wood glue dries. The seat cushion on this chair was glued on at some point and would not come off. So, I used a pry bar to loosen the joints even more so that I could get glue in each seam. I was really careful to gently pry the chair apart in order to avoid scratching the wood. I recovered the chairs in a fun faux looking fur. I love how they changed our eat-in kitchen.